Paul Strassmann’s blog: 050. What returns can we expect from the stock market? 050. What returns can we expect from the stock market? As of 2/25/2016, the Total Market Capitalization is at $ 19779.4 billion, which is about 109.5% above the last reported GDP. 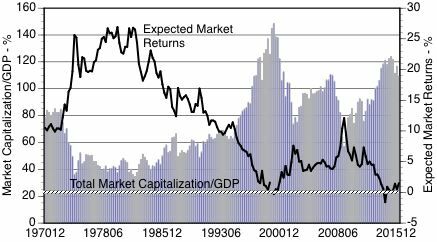 The US stock market is positioned for an average annualized return of 1.5%, estimated from the historical valuations of the stock market. This includes the returns from the dividends, currently yielding at 2.15%. The TMC/GNP ratio has varied within a very wide range. The lowest point was about 35% in the previous deep recession of 1982, while the highest point was 148% during the tech bubble in 2000. The market went from extremely undervalued in 1982 to extremely overvalued in 2000. CONCLUSION: The market is currently significantly overvalued and its expected returns can be expected to be close to zero. This does not offer favorable investment opportunities.